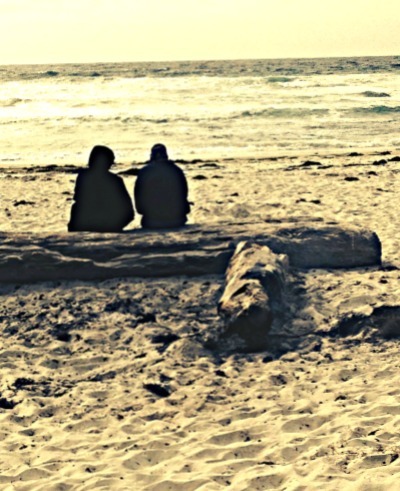 Asilomar Beach and Asilomar State Park near the infamous 17 Mile Drive, are places where time seems to almost stop. The tranquility and serene feel that overtakes you here is calming, and just what you need for that romantic getaway you have been planning. This is a place where you can feel and hear the incredible power of crashing waves and where it just seems perfect to walk and walk for long distances along the shore. Robert Louis Stevenson was well known as a pundent and writer while he lived along the Pacific Coast and left many quotations. "Waves cursing slowly vast and green, curling their translucent necks and bursting forth with suprising uproar, waxing and waining up and down the long keyboard of the beach"
That's how it is here. The water is deep blue, and the tidepools hold crab, mussels, sea urchins and anemone. There are blond and black sea lions, harbour seals, and on occasion, the errant elephant seal who made the mistake of thinking this beach was his breeding grounds instead of the more private beach at Santa Cruz north. The sand here is hard packed so it's a nice beach for a romantic stroll or extended running. Parking can be a headache on weekends, so make sure that if you are visiting for the unusually nice sunsets, that you get here early for a spot. Asilomar Beach is part of the Asilomar Marine Reserve, part of four distinct areas along the Pacific Grove coast. 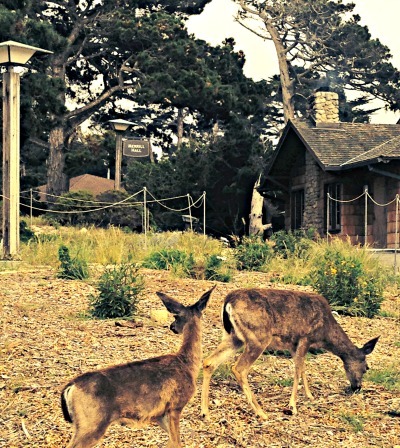 The Asilomar Reserve stretches form Point Pinos at the tip of Pacific Grove to Point Joe just a little farther south. The area is a protected space and is used for research and to improve the health and well-being of marine habitat. On Your Way To The Beach! 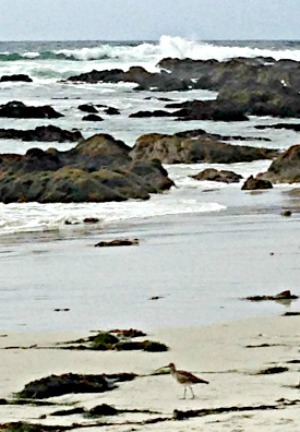 One of the things that appeals to many who visit here is that you can explore the mile long beach that is rare on the Pacific Coast. I personally enjoy walking on this beach for long periods of time, enjoying the crisp sometimes pungent air, the sounds of sea birds ... and sometimes I enjoy having a destination. Asilomar Beach offers all those things, and if you go on a week day when the fog is offshore, this is a really nice stop. 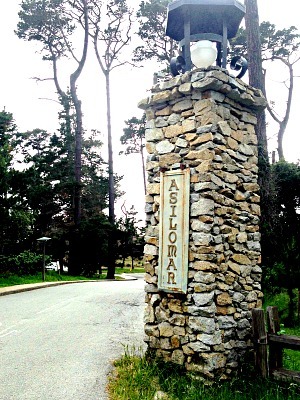 Asilomar is at the very border between Pacific Grove and Pebble Beach. You can pay the $10 to go thru the gate to get to Spanish Bay and the resort that makes up part of this coastine or ... you can take a detour after you enjoy Asilomar Beach, and then walk a little farther south on the beach. Look for the boardwalk that lies just behind the dunes and connects near Sunset Drive. There are no signs on the boardwalk but after about a 1/2 mile, you will see that the boardwalk turns inland toward the Spanish Bay Golf Course. There is a concrete golf path then another boardwalk. Turn right and before you begin second guessing yourselves, the Inn at the Spanish Bay Resort deck, fireplace pits and Sticks restaurant appear. The restaurant Sticks is a great place for a very informal late lunch. 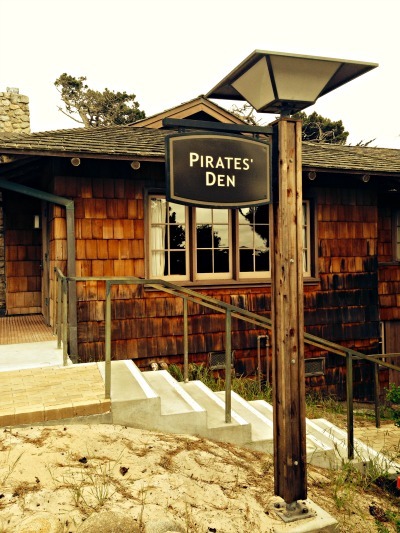 Take a tour of this fabulous resort, hang around for awhile, and then make your way back to Asilomar Beach to catch the setting sun and feel the romance. Rolling Waves Wash Your Cares Away ... Guaranteed! Weddings on the beach are allowed and even encouraged as long as the needed permits are put in place before the ceremony. The backdrop is gorgeous with jagged rock outcroppings and whitewater in the surf. If your looking for a memorable wedding location where privacy is not a big concern, and the number of guests is small, there are segments of this beach that would be a nice setting for a ceremony and picture shoot. Contact the Special Events consultant by calling 831 649.7118. Since the temperature and wind here can vary, a ceremony in early spring or early fall would provide the best chance for good weather. Deer wander the acres of grounds and there is an away from it all serene feel. 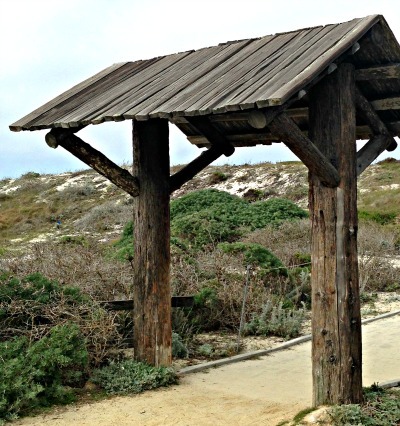 The beach is a hundred yards down the boardwalk and there is quick access to restrooms and Phoebe's Cafe since there are no facilities along Asilomar Beach. The grounds tell a tale of vintage charm. If you decide to linger for awhile, you might consider the clever cell phone tours availble by brochure at the main conference desk. If your interested in staying here for a few nights be aware that reservations are sometimes difficult to book. I have stayed here twice in the last 15 years, and the accommodations are dated, with no phones, TV or much privacy. That dozen't seem to deter many from enjoying this seaside refuge, but just be aware and maybe check out the rooms before you commit for any long stay. 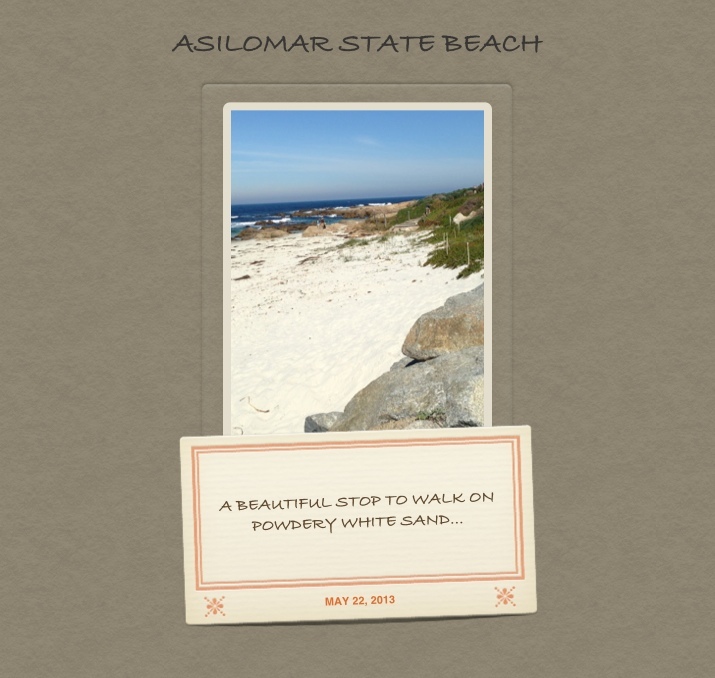 Asilomar Beach: Please consult the map link below,but the easiest way to find Asilomar Beach is to exit Highway 1 just south of Monterey and before you get to Carmel. Take Highway 68 west to Pacific Grove, turn left on Sunset Drive in Pacific Grove and follow Sunset Drive to Asilomar Beach. 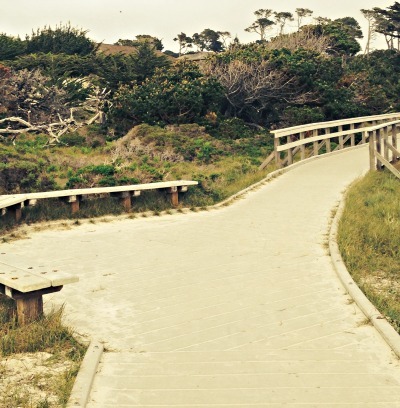 Asilomar State Beach and Conference Center: Follow the same direction to Asilomar State Beach and make a right turn from Sunset Drive to Asilomar Avenue.